The iPhone is the hottest gadget of our generation, and much of its success has been fueled by the App Store, Apple’s online marketplace for iPhone applications. Over 1 billion apps have been downloaded in the 9 months the App Store has been open, ranging from the simplest games to the most complex business apps. Everyone has an idea for the next best-selling iPhone app—presumably that’s why you’re reading this now. And with the release of the iPad, this demand will just continue to grow. So how do you build an application for the iPhone and iPad? Don’t you need to spend years learning complicated programming languages? What about Objective-C, Cocoa Touch, and the SDK? The answer is that you don’t need to know any of those things. 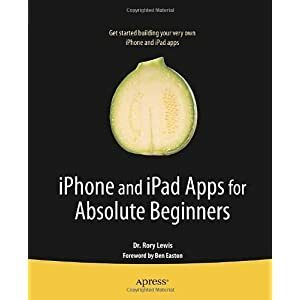 Anybody can start building simple applications for the iPhone and iPad, and this book will show you how. This book takes you to getting your first applications up and running using plain English and practical examples. It cuts through the fog of jargon and misinformation that surrounds iPhone and iPad application development, and gives you simple, step-by-step instructions to get you started. Get both yourself and your computer set up for iPhone and iPad application development. Start by making small changes to existing applications to build your knowledge and experience before creating your own applications. Follow steps in plain English to build simple apps and get them working immediately. Style your application so that it looks good and users can easily navigate through it. Make use of the iPhone’s touch screen and accelerometer. Use shortcuts and cheat sheets to create apps the easy way. Rory Lewis is a 48-year-old Assistant Professor of Computer Science at the University of Colorado at Colorado Springs. He is often mistaken for the Hippie with the dead-head shirts walking aimlessly around the campus. He is often described as the guy in the office where students are always lined up outside. He is often heralded as the dude that will explain your math and computer code, even when he first checks and sees you’ve done 800 tweets and 2700 Facebook comments while you should have been in class! He is described by his adult daughters as a dad that was once a successful microprocessor litigation lawyer in Palo Alto but couldn’t resist his dorkiness and went back to school to become a doctor of Geekdom! Joseph R. Lewis is chief web architect at Sandia National Laboratories, and is a recognized expert in standards- based web development, information design, Semantic Web, and scientific collaboration. In an earlier life, Joe was a professional musician. A graduate of the New England Conservatory of Music in Boston, he has performed with orchestras and chamber ensembles in major concert halls and music festivals across North America and Europe.